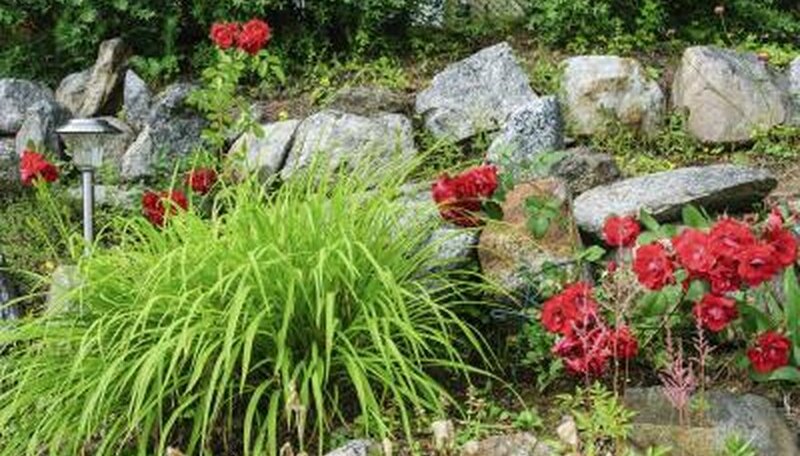 Transforming all or part of a flower bed into a rock garden creates visual interest in your yard, whether you want to add a surprising new element or add height in a small or flat garden. You will probably need to move some of the plants to new locations and add new plants, so make a plan well before you start work, and create the rock garden in early spring or early fall so any new plants have cool weather to help ease their adjustment into the new rock garden. Mimicking nature, rock gardens typically appear on sloping hillsides. If your current flower bed is flat, plan on adding enough new soil to create a berm or slope within the flower bed -- even a 3- to 4-foot slope creates a charming, miniature rock garden. Unless existing plants will grow at the bottom of the slope, move them temporarily so their roots don't get smothered with the added soil. Choose a well-draining soil mix so water sinks down quickly and doesn't simply run down the sides of the slope. An interesting rock garden includes both large and small rocks placed in random patterns, with larger rocks set alone and small ones grouped in sets of three or five. Depending on the size of the flower bed and the slope, you may need to have a nursery deliver and place large rocks that take three or four people to move. Place large rocks first, either digging small depressions for them to sit securely in or setting them down before adding soil. The rocks will look more natural sitting with about one-third of their mass below the surface of the soil. Shrubs currently in your flower bed will work on a slope if they don't need constant moisture or overly rich soil. Place those plants near the bottom of the slope where they will get the most water. Good choices for rock garden shrubs include "Blue Star" juniper (Juniperus squamata "Blue Star"), which grows in a mounded shape 1 to 3 feet tall in U.S. Department of Agriculture plant hardiness zones 4 through 8 and Irene rosemary (Rosmarinus officinalis "Renzels" Irene), a trailing type that grows 12 to 18 inches tall in USDA zones 7 through 10. Traditional small plants for rock gardens include spring bulbs. If your flower bed has tulips (Tulipa spp. ), which grow in USDA zones 3 through 8, and daffodils (Narcissus spp. ), which grow in USDA zones 3 through 8, you can dig those up and replant them on the newly formed slope. Succulents of all types also work well in rock gardens, including hardy hens-and-chicks (Sempervivum tectorum), also called house leeks, which grow in USDA zones 3 through 8. Missouri Botanical Garden: Narcissus "King Alfred"